I've followed Josef Prusa's work for several years and even built a couple of earlier i3s with friends. Two recent developments caught my attention and I just felt compelled to check them out myself. The first development is a sensor and compensation system that actually corrects for skewed X-Y geometry on a Cartesian printer. The second is a new dual/quad multi material upgrade. The i3 MK2 with the geometry correction is available now but the multi material upgrade is pre-order with shipping expected to start in January. I put in my order for the printer and quad upgrade about 4 weeks ago. The printer arrived, on time, last Thursday. I got busy putting the kit together on Friday. Here's the traditional "open box" photo. The kit is very well packed and everything survived the trip from Czechoslovakia in tact. The printed Assembly Instructions and 3D Printer Handbook were an unexpected surprise and was an early indication of the focus on usability that Prusa puts into these kits. The next pleasant surprise was that all of the tools needed for assembly were shipped with the printer - I thought I was the only kit manufacturer that did that with my fly fishing reel kits! All of the parts were top notch from the 3D printed parts, to the authentic E3D V7 hotend and mini RAMBo control board. The Z axis steppers actually have the screws integrated as the stepper shaft - there is no coupler. This is an interesting idea and simplification that eliminates a potential point of problems. The printer also comes with a PEI print surface (need I jump for enthusiastic joy about that?) along with a roll of quality PLA and a glue stick to treat the bed for printing other materials. The kit includes everything a beginner (or experienced) 3D printer needs to be successful. The only significant thing missing is a part removal spatula like the type SeeMeCNC include with their Rostock MAX kits. Assembly was a pleasant 6 hours (including photographs along the way). The manual has an on-line version with lots of user comments and tips. I used a combination of both, finding the high resolution photos online to be very helpful. Once the machine was assembled, it was time to commission it. Here's where Prusa's attention to usability really shines. The firmware is pre-installed and, more importantly, is customized to tightly integrate with the probing system and calibration. When you first turn on, the firmware recognizes a new printer and guides you through an integrated Self Test that checks stepper motion, hot end and bed heaters, fans and end stops. Very clever and very helpful. My printer completed the Self Test without issues. Once the initial check completes, calibration is the next step. Again, this is simply a matter of selecting an option from the LCD panel. The printer runs through its paces scanning each of the nine probe points that are manufactured into the heat bed itself. Again, very clever and tightly integrated. Upon completion I was informed that I had slight skew but that would be removed by the compensation. So onward I pressed. Calibrating the probe is probably the most difficult step and it is quite easy with the docs and videos Prusa provides. Once Z height is calibrated, it can be easily tweaked - even in the middle of a print - from a panel menu and using the knob to move the nozzle up and down. The included calibration gcode simply draws simple back and forth lines on the bed as you tweak the height until the first layer looks good and sticks well. Very simple and it really makes this critical calibration simple for even beginners. My first print was the Prusa name tag as recommended. It came out perfect with an excellent first layer and no stringing or blobbing (the gcode was provided). My second print was a case for a Raspberry Pi to run OctoPrint to control the i3 MK2. I used KISSlicer and again, the print came out really nice. I've since printed nearly a Kg of several different PLAs including the matte fiber HTPLA from Proto-Pasta that I really like for my fly fishing reel kit parts. The material printed like a dream. It really made me aware of how trouble free direct extruders are over extruders using a Bowden tube like all of delta printers have. Next I decided to try the new Prusa Edition of Slic3r. Apparently, Prusa has been working to improve, add features and reliability to Slic3r. Frankly, I've had so many bad experiences with Slic3r that I rarely use it. But Prusa's Edition is a different beast. This new version has a really interesting Cubic infill type that results in better 3D rigidity. It is very cool and I can see using this for some of my work. Another really nice feature is "Ensure wall thickness", which looks ahead and determines how much support and walls are needed UNDER upper layers in order to print nicely. 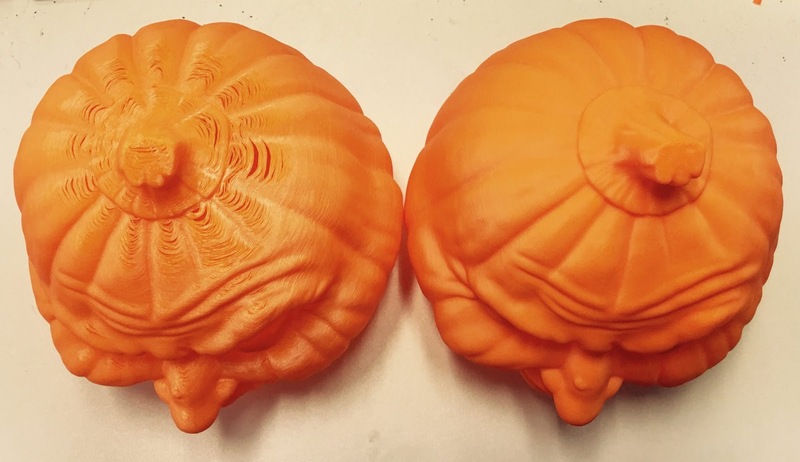 The example Pumpkin Head print really shows the spectacular results. Although I rarely use a slicer's support tools (I either design supports into the parts I design or I add them to others' designs in an STL editing tool) a lot of work has been done in this area. Overall, I am quite pleased with the gcode and prints I'm getting with Slic3r Prusa Edition. I'll continue to use it for the i3 MK2. Prusa has committed to continuing development and rewriting the app in C++ for performance. It should be interesting to watch what comes out of this development. The Prusa i3 MK2 kit is a great 3D printer for a very reasonable price. There really were no compromises in its design and components. As refined as the actual printer design is though, what really sets the i3 MK2 apart from every other printer - kit or pre-built - that I've seen/used/built is Prusa's holistic approach to ensure a great user experience from the time the box is opened to the the completion of the first print. Details like integrated Self Test and sophisticated calibration in the firmware to support this experience should pay dividends with happy users! I can hardly wait for the quad multi filament upgrade. 4 comments to ''New Prusa i3 MK2 build"
Have you installed the quad filament upgrade yet? Made any other upgrades? Can you share the g-code for the Raspberry Pi case you printed? Thanks! If I had the g-code I would be happy to but this one is long gone, sorry.